Make checks payable to 442nd Legacy Center (note “76th luncheon” on your check). or Mae Isonaga at 222-5680. Note: Hale Ikena capacity is limited therefore please submit registration with payment as soon as possible. 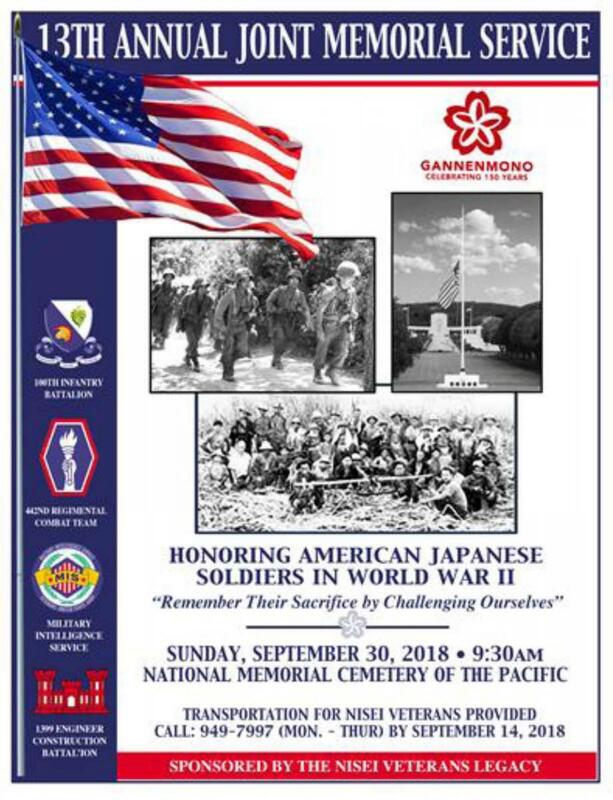 The 13th Annual Joint Memorial Service (JMS), honoring Japanese American Soldiers in World War II, will be held at 9:30 am on Sunday, September 30, 2018 at the National Memorial Cemetery of the Pacific, Honolulu, Hawaii. Tom Coffman, author of books on the history and political development of Hawai’i, will be our keynote speaker. 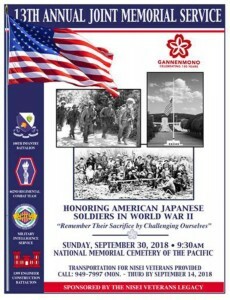 Nisei veterans and their personal care attendants who would like to arrange for transportation to attend this ceremony should call 949-7997 (Mon-Thu) by September 14, 2018. 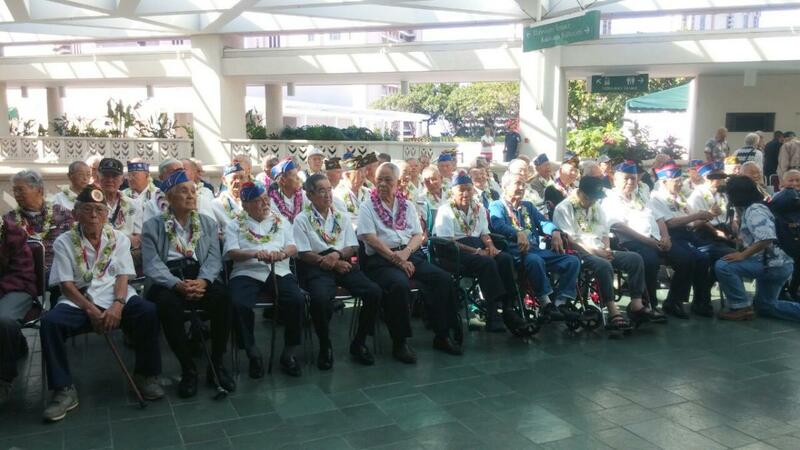 We hope that all Nisei veterans who can join us will take advantage of this free service. For further information about the JMS, please contact Larry Enomoto, (808) 255-8971, JMS Co-Chair. On June 25, 2018, the California State Senate will be passing a resolution honoring the 75th anniversary of the formation of the 442nd Regimental Combat Team. The Go For Broke National Education Center wishes to extend an invitation to our veterans, families and friends in Hawaii in hopes that some can join us in Sacramento for this event. Here is an informational letter on the event. For any questions and to attend, please contact Ms. Erin Sato of the Go For Broke NEC. Attend and you will be able to meet friends and families of the 100th, 442nd, MIS, 1399 and other friends from the West Coast and other areas. There will be a welcome banquet on Monday nite (15th) and and a farewell banquet luncheon on Wednesday (17th). We’ll as usual have our own Hospitality Room. We have several days of slot tournaments, shopping excursions and of course all the gambling you wish for. A group tour is being organized from Hawaii for the dates of October 14 to October 19, 2018 (5 nights). See the Registration form below. The payment deadline to join the tour is Tuesday, August 8th. Any questions, call S&D member and tour organizer Ann Kabasawa at 781-8540 or e-mail at diverseinnov@gmail.com. ALL ARE WELCOME TO COME AND HAVE FUN!!!! 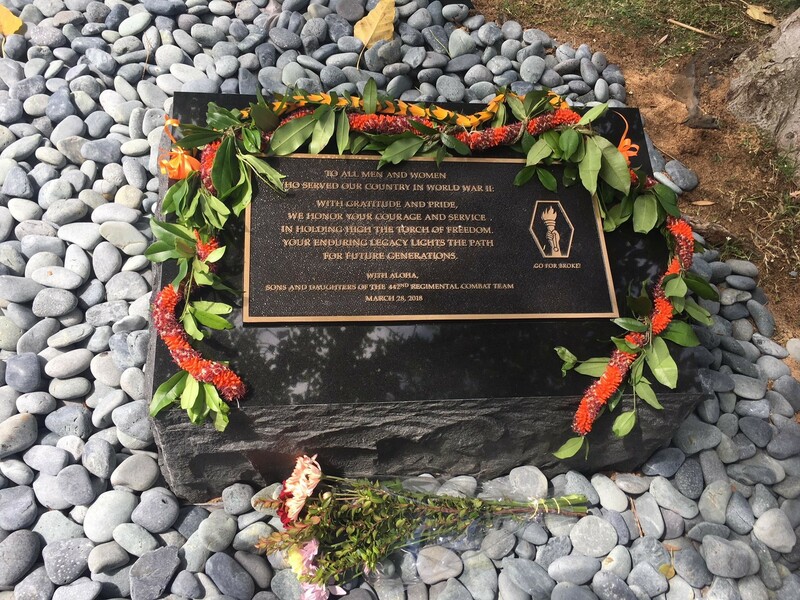 On March 16¸ 2018 the Sons & Daughters of the 442nd RCT held a ceremony at the National Memorial Cemetery of the Pacific at Punchbowl (Oahu) to dedicate a memorial monument for their fathers, uncles and friends of the 442nd RCT and all men and women who served our country in World War II. The 442nd RCT torch and “Go For Broke!” motto highlight the plaque for perpetuity. 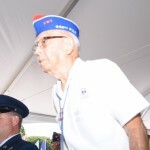 About 35 people attended the ceremony¸ including 8 veterans who made their way up the Walkway like true dedicated soldiers. 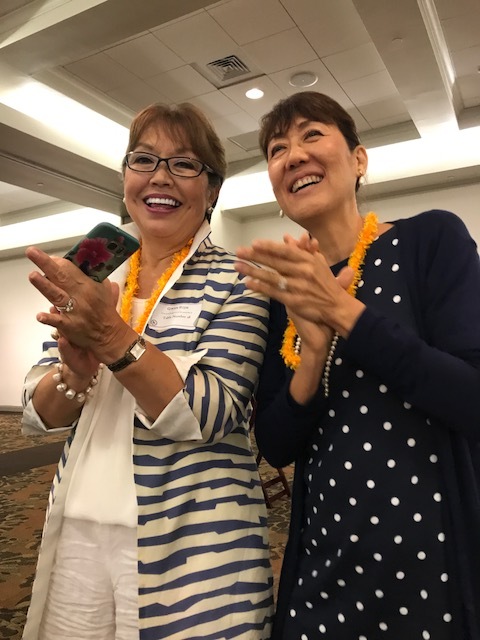 Sons & Daughters president Grace Tsubata Fujii opened the ceremony and Eileen Sakai¸ former Sons & Daughters president¸ spoke on keeping the 442nd RCT legacy alive in the present and the future. 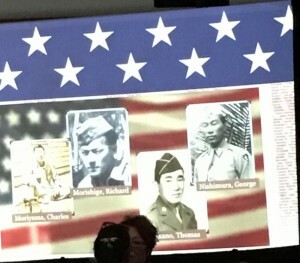 Judge Frances Wong gave the invocation¸ recognizing the fact that there were both Christian and Buddhist 442nd RCT veterans¸ and then gave a benediction that paid tribute to the spirit and legacy of the 442nd RCT veterans. Sandy Tsukiyama gave powerful renditions of the “Star Spangled Banner¸” “Hawai’i Pono’i¸” and “America the Beautiful” and Alan Miyamura moved the audience with “Amazing Grace” on his bagpipes. As lei were placed on the memorial monument¸ Stanton Haugen honored the soldiers of World War II with a haunting “Taps” on his bugle. 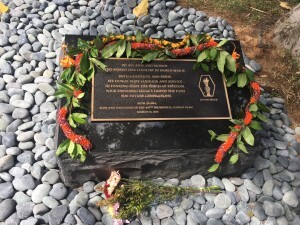 Please go to see this new monument on the Memorial Walkway when you next stop at Punchbowl. Yes, we are having another George Company and Friends Reunion for 2018. This year our get together will take place in Alpine (near San Diego) at the beautiful Viejas Casino and Resort. Some of us will be going to Viejas to stay from Monday, the 23rd of April and checking out on the 26th. The actual dinner will be on Tuesday, the 24th and the hospitality luncheon at the Penthouse Suite will be on Wednesday, the 25th. Please find attached the information about the George Co. and friends Reunion. Please let everyone know……we are looking for a time of talking story and having fun together!!! Please be aware the deadline for rooms that we are holding at that special rate is March 22nd. Deadline for the banquet is April 1, 2018. We hope that all of you folks can come!!! Bring your family and friends!! If you have any questions, please call Ann Kabasawa at (808) 781-8540 or e-mail her at diverseinnov@gmail.com. Hope to see all of you there!!! An exhibit of Children’s Expressions of Peace from the Okinawa Prefectural Peace Memorial Museum is open from February 1 to March 5, 2018 at the 100th Inf Bn Veterans Clubhouse. The exhibit will be open on weekdays only to March 5 from 9:00 am to 1:00 pm. It will be closed on weekends. Parking is at the Clubhouse or on the street. The exhibit includes stunningly beautiful artwork, poetry and essays by students in Okinawa reflecting the reality of War on their homeland and their hopes for peace. This year, over 16 award winning pieces (all different from last year’s works) are on display. 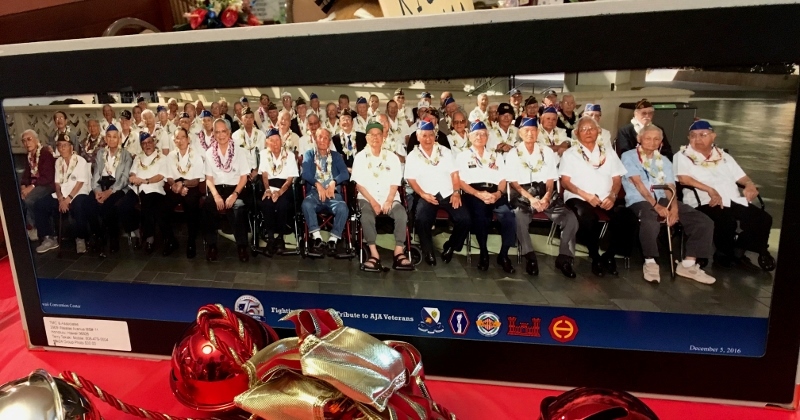 Also on exhibit are profiles of three Military Intelligence Service WWII veterans with roots in Hawaii: Dr. Shinye Gima, the late Takejiro Higa and Herbert Yanamura. The displays on MIS veterans include personal photos, their memories of their wartime service and what life was like before and after the war. There is no admission fee for the exhibit. 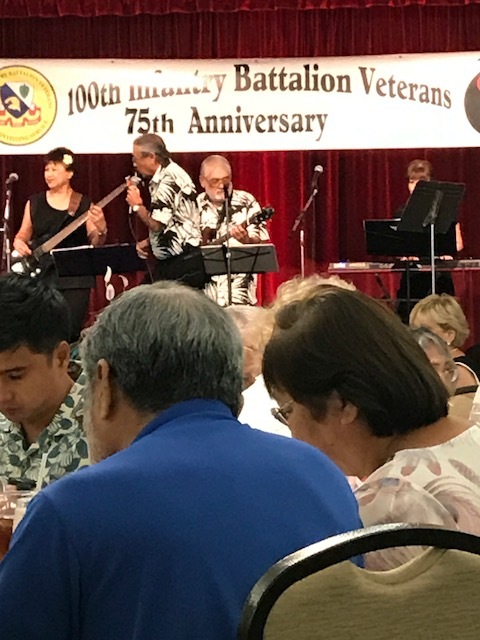 The Sons and Daughters of the 442nd were well represented at the 100th Battalion’s 75th Anniversary Banquet, which was held on Sunday, July 23, 10am-2pm, at the Pomaikai Ballroom at Dole Cannery. We had two full tables – including officers Grace Fujii, Juanita Allen and Shirley Igarashi, and members Gwen and Clayton Fujie, Glenn and Edean Goya, Lynn Heirakuji, Phyllis Hironaka, Anita Nihei and Ken Akinaka. Wes Deguchi, representing the NVL, was also present. (Sorry if we missed anyone.) Also our guests Mr. and Mrs. King Lit Ching sat with us. 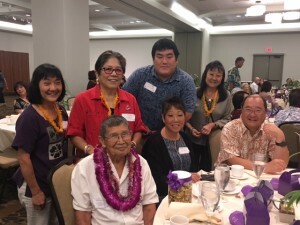 He is the son of Hung Wai Ching, who in 1940 was part of the Hawaii Council for Interracial Unity that helped prepare the local Issei community for the impending war. 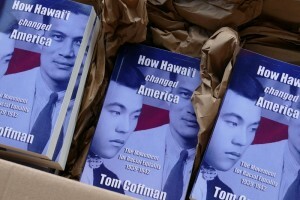 King Lit is working with us, the S&D, to fundraise for Tom Coffman’s new book, How Hawaii Changed America. The banquet was wonderful – the 100th can sure do these events up right! They had all of the veterans march in as their names were called, there was a 75th Anniversary cake, and the entertainment was spectacular. During our meal, we were entertained by The Ebb Tides playing everything from Hawaiian to Japanese to swing music. Afterwards, a young performer in full traditional attire including white face makeup, did several Japanese dances. This was followed by his luring audience members up to dance – and the first one up was our own Gwen Fujie, followed quickly by Anita Nihei. 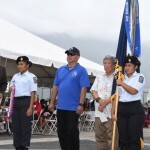 Before it was all over, they had been joined by Grace Fujii and – Japan Consul General Misawa, Hawaii Governor Ige and Honolulu Mayor Caldwell. Clearly the best way ever to end the banquet. We truly hope that the 100th continues with a 76th Anniversary Banquet in 2018. 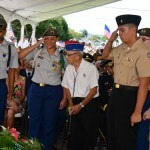 The Third Annual Wahiawa War Memorial Ceremony will be held on July 16 to commemorate the 21 Wahiawa veterans who gave their lives during World War II, and recognize their families for the sacrifices they made during the war. The event, which will begin at 4 p.m. at Wahiawa District Park in the Hale Okipa building, is free and open to the public. The history of the soldiers and community members who worked to build the first city swimming pool in 1949 also will be shared. 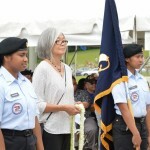 The ceremony will open with the Kapolei High School Marine Corps JROTC opening color guard, Ryugen Taiko Group and a special 21-gun salute. 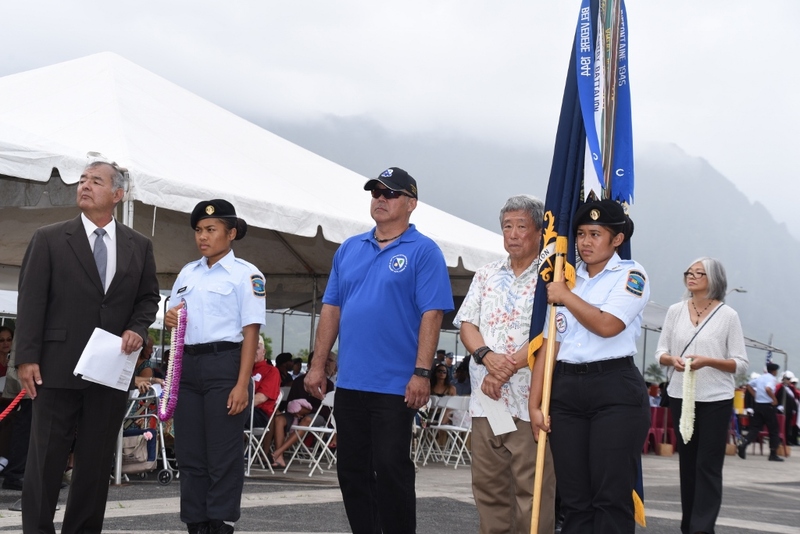 Guest speakers include representatives from veterans’ organizations and community groups to pay tribute to veterans from the 100th Infantry Battalion and 442nd Regimental Combat Team. The event also will feature a performance by the Royal Hawaiian Band. 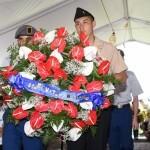 The sponsoring Wahiawa Lions Club will have a wreath and the Wahiawa Rainbow Seniors will make lei for the families to present during the ceremony. 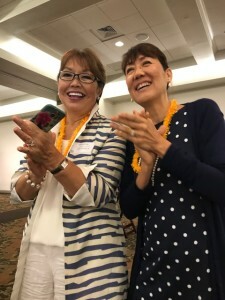 Community organizations such as the Wahiawa Community and Business Association, the Wahiawa Nikkei Civic Association, the Wahiawa-­Whitmore Neighborhood Board and Wahiawa elected officials also will present lei during the ceremony. 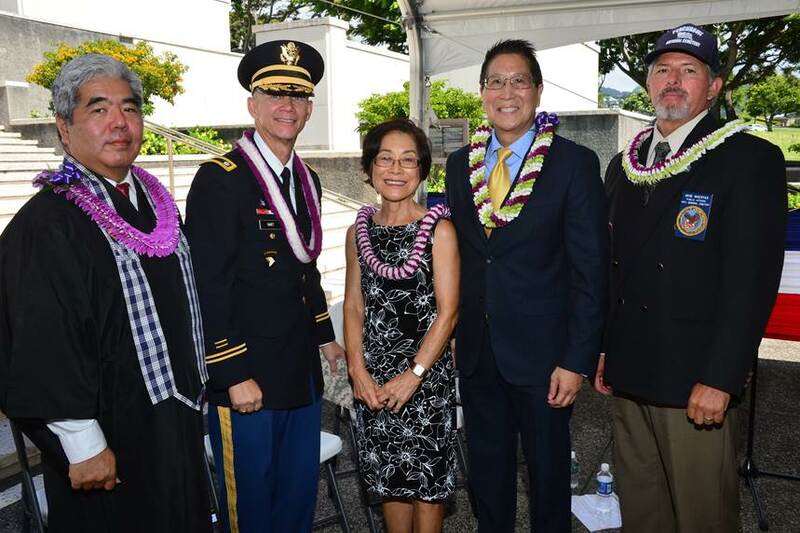 Members of the S&D of the 442nd RCT and of the 100th Infantry Battalion Descendants will be attending the ceremony and also will present lei. In our monthly meeting of 4 May, the members voted to support the work of Tom Coffman to publish a new book on the Hawaii AJA experience in WW2. Tom is the acclaimed author of deeply researched and powerfully written books on AJA history, particularly focused on pre- and post-WW2 Hawaii. This includes Catch a Wave (required reading in many high school and college courses), I Respectfully Dissent, a biography of Edward H. Nakamura, and How Hawaii Changed America, The Movement for Racial Equality 1939-1942. This latter book was intended as Volume 1, with Volume 2 to cover 1942 thru 1945. However, Duke University Press wants the new book to combine the full time period of the Hawaii AJA experience in WW2 (1939-1945) in one single book, along with a brief summation of the resulting impacts, such as statehood for Hawaii, expanded thinking on civil rights, immigration, etc. 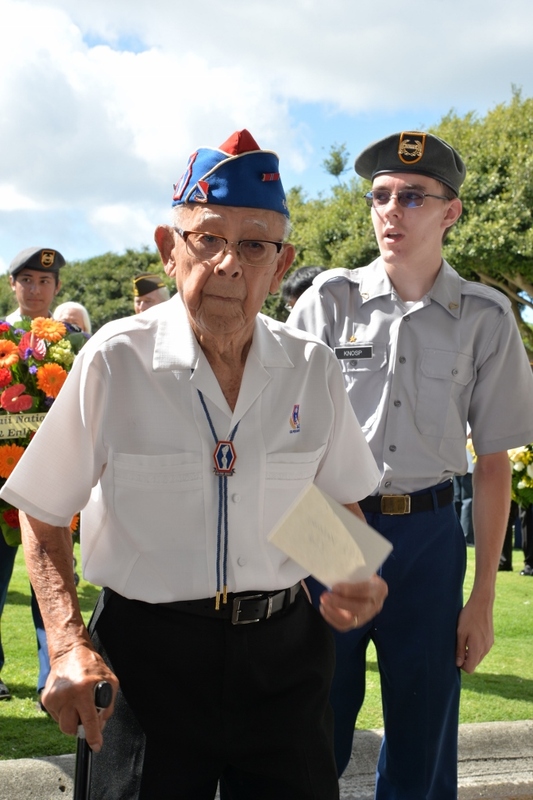 Because Duke is a nationally prestigious press, this opens the door to spreading knowledge across the Nation of the profound impact Hawaii and our Nisei veterans have had on improving America for all its diverse citizens. Tom is dedicating the next twelve months to get it researched, written and delivered to Duke for publication and distribution. As many of you know, Tom is an independent researcher/writer and documentary film producer who approaches history from the grassroots up. His work is distinguished by both depth and innovation. If we the S&D are to preserve and protect the 442nd legacy, we need to support the development of such in-depth history. For this purpose we have initiated a new special project, the “How Hawaii Changed America” project to conduct and manage fund-raising efforts to support the research, writing and publication of this book. 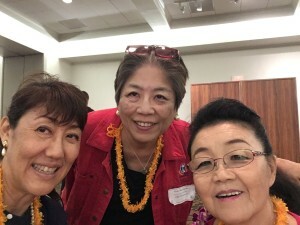 The MIS Club and Nisei Veterans Legacy (NVL) have also agreed to support a fund-raising effort in their respective memberships. Why should the S&D support this effort? This new book will breathe with the tensions and possibilities that swelled up through the war. The resulting transformation of Hawai’i from an overseas colony, ruled by a select few, to a robust multiracial state, takes on heightened meaning with the passage of time. Hawai’i has contributed to the passage of national civil rights legislation, liberalization of immigration laws, strengthening of the institutional safeguards of liberty, the increase of East-West exchange, the spread of democracy in Asia, and a general improvement of relationship between East and West, ironically between Japan and the United States. For a time these developments merely seemed to be inevitable aspects of a great wave of progressive change. Today they stand out as signal lights against the rising storm of global tribalization, intolerance and fanaticism. 2. This story is only sketchily known in Hawaii and is unknown to our fellow Americans on the Mainland. We believe this will change the way history is understood. This is not an academic exercise. We cannot ignore the disquieting signs of a rising tide of intolerance eroding away the hard fought gains in racial equality, else the legacy of our fathers, grandfathers, uncles will cease to have meaning. Supporting the completion and publication of this book is a small task on our part, but with large benefits to preserving and protecting the legacy of the 442nd veterans and all Nisei veterans. How much money do we need to raise, and how will it be spent? 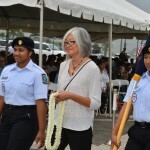 • Tom has estimated that $35,000 will be needed for the costs of travel and research in archives on the Mainland, and monthly expenses during the next 12 months. • The MIS Club and NVL will be assisting us in this fund-raising effort. • Publication costs are not part of this fund-raising project. These costs will be handled by Duke University Press itself. • The S&D will match your donation up to $200 per S&D member, adding more “bang for your buck,” up to a total of $5,000 of member donations. • It would be most appreciated if you could send your donation by the end of this month (31 May). • Please pass the word — tell your relatives and friends about this new book and the story it will tell of the Hawaii AJA WW2 experience and their contribution to a better America. Please encourage them to donate also. Brian Yamamoto of Alaska will be leading and organizing stops on a 75th Anniversary Tour of France in July 2019. Brian and his wife Leslie were on the 2009 tour with Lawson Sakai of the 442nd RCT and Friends and Family of Nisei Veterans. Brian led a 2013 tour to Italy with 43 people and a 442nd veteran and also led a 2014 France tour with 65 people and two 442nd veterans. He is working with Nora Di Bievre on planning the 2019 trip. Nora was one of the guides for the 2014 France tour and also led the study group a year later with Stuart Hirai’s group. Details for the 2019 tour are currently being worked out and the organizers expect an itinerary to be available in the first part of 2018. They are hoping to plan a “short 6 day tour” to encourage any veterans who may be thinking of joining. This shorter tour will only visit the Vosges and the celebrations there around Bastille Day, July 14, 2019. There will be a “long 13-14 day tour” which will visit Sospel and L’Escarene, eventually meeting up with the “short tour” in Bruyeres. While in the Vosges, the group will visit all of the monuments which will include: 442nd RCT, Lost Battalion, Yohei Sagami Stele, Tomosu Hirahara Square, 3rd Infantry Division, 45th Infantry Division, Robert Booth, and the 405th FS. 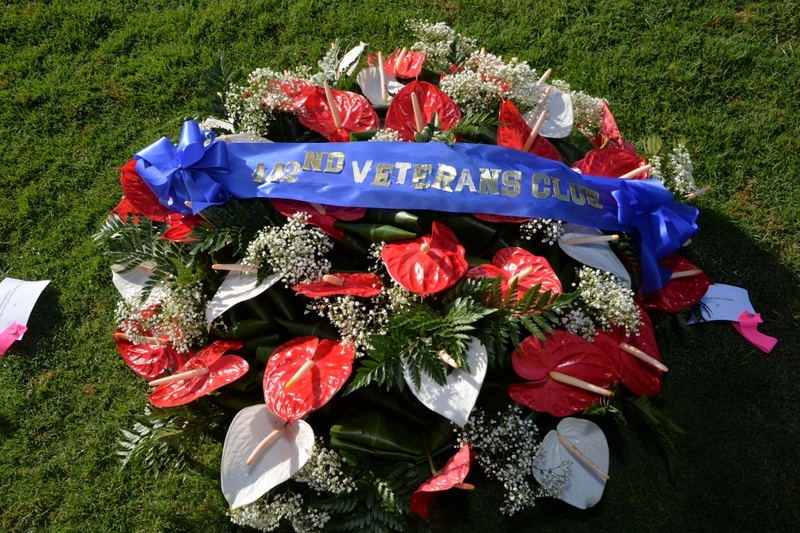 We will also visit the American Cemeteries at Epinal and Lorraine for wreath laying ceremonies. The group will place leis and flags at grave markers of the 100th/442nd soldiers buried there. Sospel and L’Escarene are in the French Maritime Alps where the Nisei troops were after the bitter fighting in the Vosges. It became known as the “Champagne Campaign”. The long tour group will place a wreath at the plaque in Sospel where Larry Miura and Kenji Sugiwara were killed. We will spend a day in Sospel visiting with the locals during special ceremonies. The tour will spend a day in L’Escarene which is famous for the Christmas party the Nisei troops held for the children in 1944. When the tour visited in 2014, there were many adults who were children at that party. The organizers will keep those interested informed of any developments for the tour periodically. They are expecting a large group for this historic occasion, so it would be a good idea to sign up early once the itinerary is available in 2018. There may be a limit for the tour of around 100 people. If you have further questions, you can contact Brian Yamamoto at brianeyamamotodds@gmail.com or write him at: 2136 Airport Way #2 Fairbanks, AK 99701. It was a very interesting afternoon. To see and talk to many veterans and their families was really something that I will remember for a long time. There were so many people who came out to honor the veterans and the slide show that was playing in the background was an additional highlight. It was nice to see my uncle’s picture when it popped up. Most of the veterans posed for the official picture, I think this was a big challenge for the photographers. But the photo came out really nice! The mistress of ceremonies, Leslie Wilcox, kept the program moving smoothly. I was really impressed with the speakers, starting with Governor David Ige, followed by former Governor George Ariyoshi, and our keynote speaker Admiral Harry B. Harris, Jr., Commander, U.S. Pacific Command. When I first heard that Gov. Ariyoshi was with the MIS, I was really surprised. Thought he was too young to be in the war! (Although he didn’t go into the service until 1944 and is about four years younger than my uncle, who was also in the MIS). One of my tablemates at the tribute was a Leilehua grad like me and we were impressed with the Leilehua High School Honors Chorus – nice to see our alma mater represented! Good job! Overall, I enjoyed the day, seeing old friends and meeting new ones. The speeches were inspiring and makes me want to try and be a better person and live up to what my parents tried to teach me as a person of Japanese ancestry. 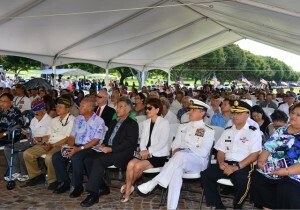 The 11th Annual Joint Memorial Service (JMS) was held at the National Memorial Cemetery of the Pacific at Punchbowl on Sunday, September 25, 2016. 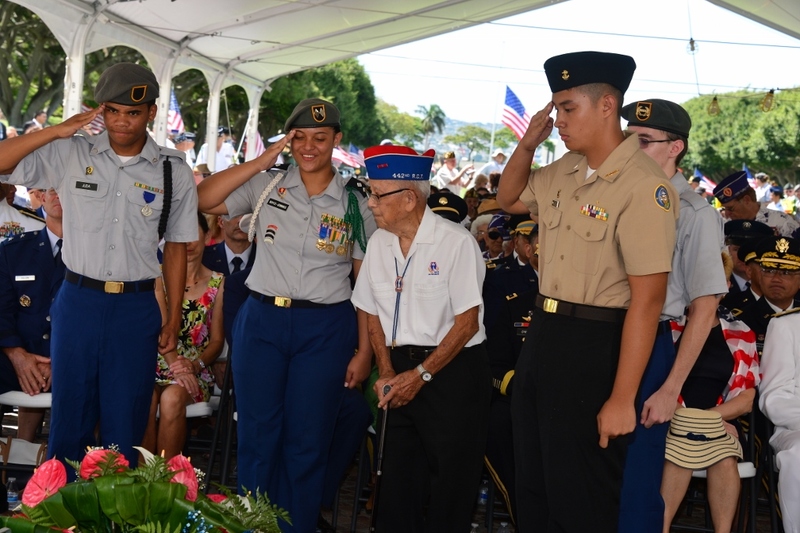 The JMS honors the soldiers who served in World War II in the 100th Infantry Battalion, 442nd Regimental Combat Team, Military Intelligence Service, and 1399th Engineer Construction Battalion. 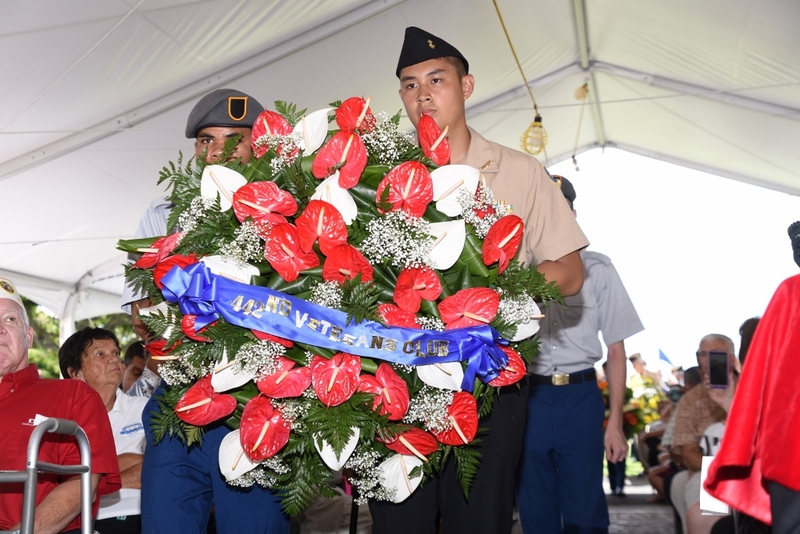 It is held annually on the last Sunday of September to commemorate September 29, 1943, the day that Shigeo “Joe” Takata of the 100th Infantry Battalion became the first AJA killed in action in World War II. 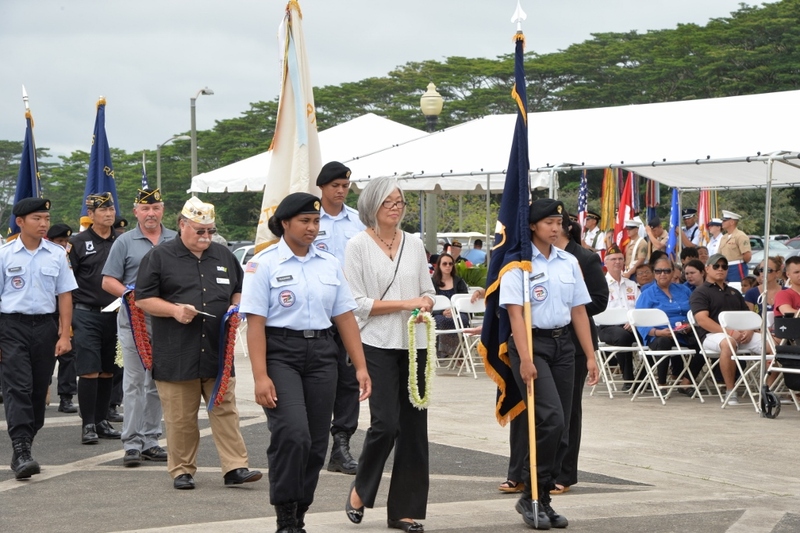 This year’s service adopted the theme of the 75th anniversary commemoration of the bombing of Pearl Harbor: Honoring the Past, Inspiring the Future. The keynote speaker was attorney and former State Senator Matt Matsunaga, son of the late U.S. Senator Spark Matsunaga who served in both the 100th Infantry Battalion and the Military Intelligence Service. Matt described his father’s long-time efforts to establish the U.S. Institute of Peace, which was inspired primarily from his wartime experience. 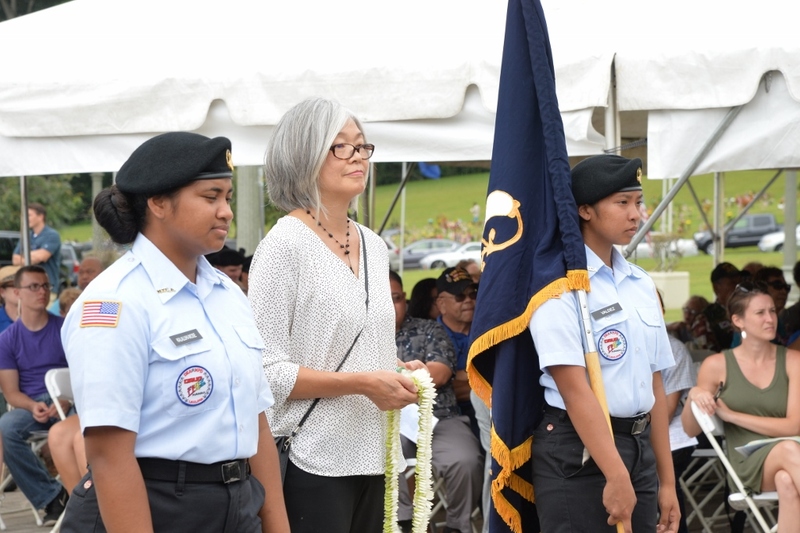 Lynn Heirakuji, whose father Walter Heirakuji served in K Company of the 442nd RCT, was the event Chairperson and Barbara Tanabe, whose father Frank Tanabe served with the MIS, was the emcee. 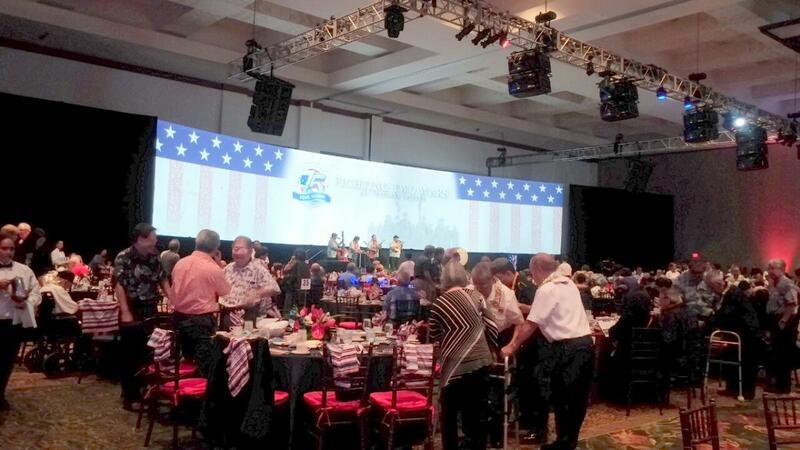 Mahalo to all the hardworking volunteers who made this event possible. Next year’s JMS will be held on Sunday, September 24 and the NVLC is seeking a chairperson or co-chairpersons. 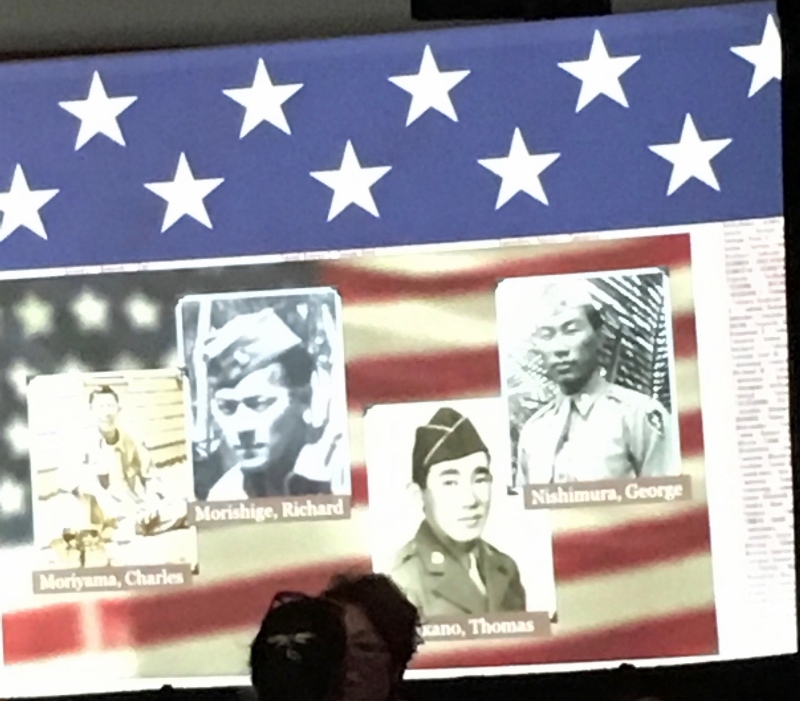 Please contact Wes Deguchi at 722-4728 if you are able to serve and help continue this important legacy event to honor the Nisei soldiers of WWII. The attendees at the JMS, including Gov. 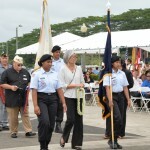 and Mrs. Ige and Admiral Harry Harris. The 11th Annual JMS was filmed and will be shown on Oceanic Ch. 53 on these dates. 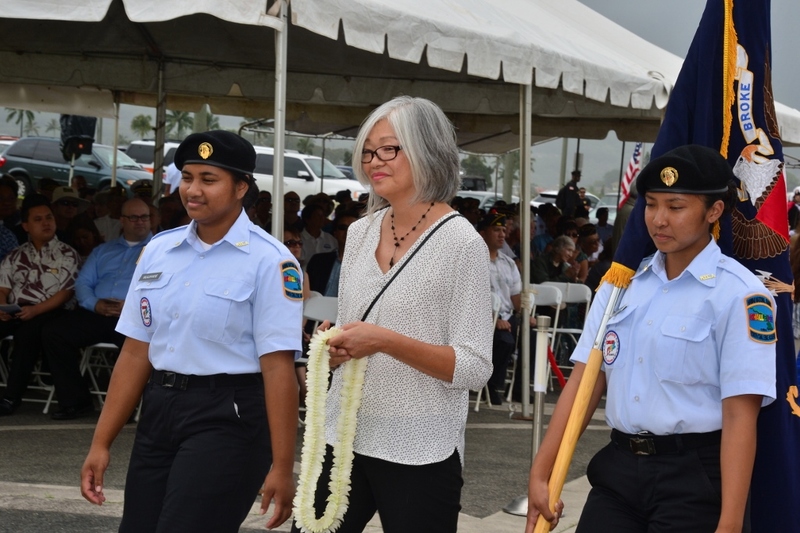 The 11th Annual Joint Memorial Service (JMS) which is open to the public was held on Sunday, September 25, 2016, at 10 am at the National Memorial Cemetery of the Pacific. 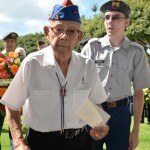 The JMS is held to honor the Japanese American Soldiers who served in WWII, specifically, those in the 100th Infantry Battalion, the 442nd Regimental Combat Team, the Military Intelligence Service, and the 1399th Engineer Construction Battalion. 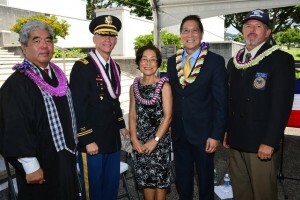 Thirty-three thousand Japanese Americans served in the U.S. Armed Forces during WWII and 800 lost their lives fighting for this country, which had initially classified them as “enemy aliens.” The wartime service of the Nisei Veterans was instrumental in helping to shift the racial mood of the country toward Japanese Americans and lay the groundwork for the admission of Hawaii to the Union. Their exemplary service also opened the doors of social, economic and political opportunity for future generations. Mr. Matt Matsunaga, son of the late Congressman and U.S. Senator, Spark Matsunaga, will be the keynote speaker at this event. The Royal Hawaiian Band will provide musical entertainment. Thank you to All who joined Us on Sunday, September 25. 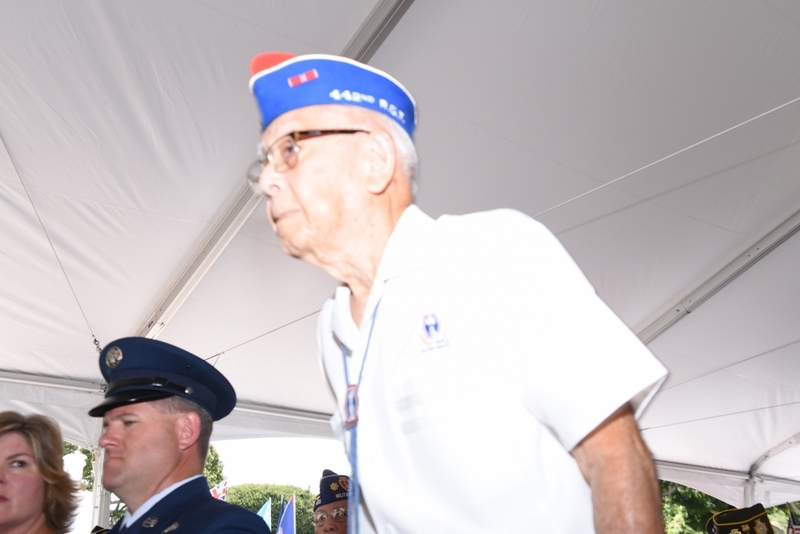 442nd RCT Veterans and Sons & Daughters of the 442nd RCT took part again this year in Memorial Day services to honor and remember those who sacrificed for our country. 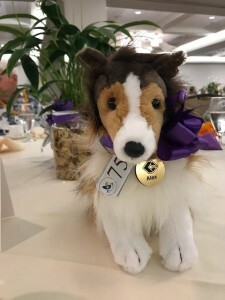 Copyright © 2009-2019 Sons and Daughters of the 442nd Regimental Combat Team. All rights reserved.